Cancer Fun Time! : Is That A Lump In Your Neck Or Are You Just Glad To See Me? Is That A Lump In Your Neck Or Are You Just Glad To See Me? For the past month or so I’ve had a sensation that there was something in my throat. It was making me slightly more prone to choking but mostly it was just bothersome. In 1995 I was diagnosed with a temporary condition called globus pharyngis or just "globus". The main symptom is the sensation of something in one’s throat. It is often psychosomatic; caused by stress. Although it can also be an indication of gastric reflux or cancer. In 1995 my globus resolved itself within a few weeks. I originally thought this was just another occurrence of it. But after it had gone on for a month or so I decided to have it checked out. One of the deficiencies in my manhood is that my medical denial is not very strong. I described the symptoms to my doctor, Doctor W. I told her I didn't feel especially stressed and I have no history of reflux. I joked that the only remaining option was cancer. She took all that in with a chuckle. Doctor W has a good sense of humor. When I went to her for a physical when I turned 50, she left the prostate exam for last. Then she said, "Neither one of us is going to enjoy this. Bend over." When I finished my globus story she looked at me for a minute from across the room. Then she asked, "What's going on on the side of your neck? 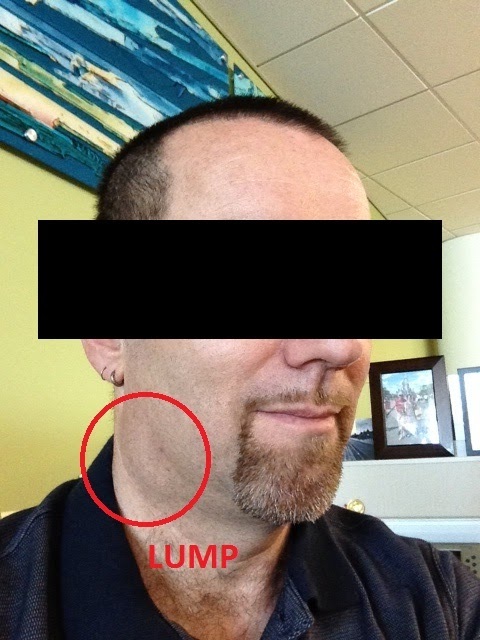 It looks like you have a swollen lymph gland. Can you feel that?" She happened to have a first-year medical student shadowing her that day and she asked him, "Did you notice that?" It was the first I'd heard of it. I felt it with my hand and it was plain as day: a large lump under the curve of my jaw on the right side. It wasn't especially firm and it wasn't especially soft. She and the medical student described it as "mobile", which I gathered was better than “fixed”. Doctor W brought me a mirror and the thing looked quite obvious. I told her it must be recent. Surely I would have noticed it while shaving? Or my wife would have noticed it? I couldn't believe the swelling was more than a few days old. Obviously we needed to investigate further with some imaging. Doctor W debated between ultrasound, which would show the thyroid better, and CT which would show the lymph node better. She decided on CT.
At the time I thought that sounded like overkill. A CT scan delivers a pretty significant radiation dose and one doesn't really want unnecessary radiation delivered to one's head. But of course Doctor W knew what she was doing.